This used to be one of my most favourite cooked dishes. Now through the wonders of new found awareness and imagination I have created a fully RAW stroganoff recipe which, frankly, you would not know was made with 100% plant ingredients with no cooking. First put the sliced mushrooms into a bowl and add the olive oil, shoyu sauce and juice of 1 lemon along with ½ tsp. of salt and a good grind of black pepper. Leave them immersed for an hour or two until fully marinaded. In your food processor or vertical blender add the cashew nuts, coconut cream, garlic, onion, juice from one lemon and the semi-dried tomatoes. Blend thoroughly. Add salt to taste. Add also a dsp. equivalent of the marinade, which will give the sauce a rich ‘reduced’ appearance. Now strain off the mushrooms into a separate prep bowl and pour in the creamy liquid. Fold in the mushrooms. If you have some of the cream left then keep that aside and use as a mayo base for salads etc. Set aside for 15 minute to let the creamy flavours infuse through the mushrooms. Drop the florettes into your food processor and pulse to a rice consistency. Add the lime juice, dash of oil and S&P to taste. 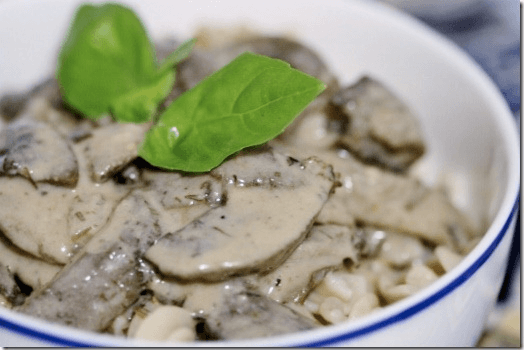 Spoon off the rice into a nice serving dish and ladle off the stroganoff mixture and top off with parsley, finishing with a drizzle of oil and a grind of pepper. This is a hearty old fashioned meal guaranteed to warm the cockles of any open heart!! Notes: You can also mix the freshly chopped parsley and mix it in with the mushroom sauce otherwise use as a garnish.